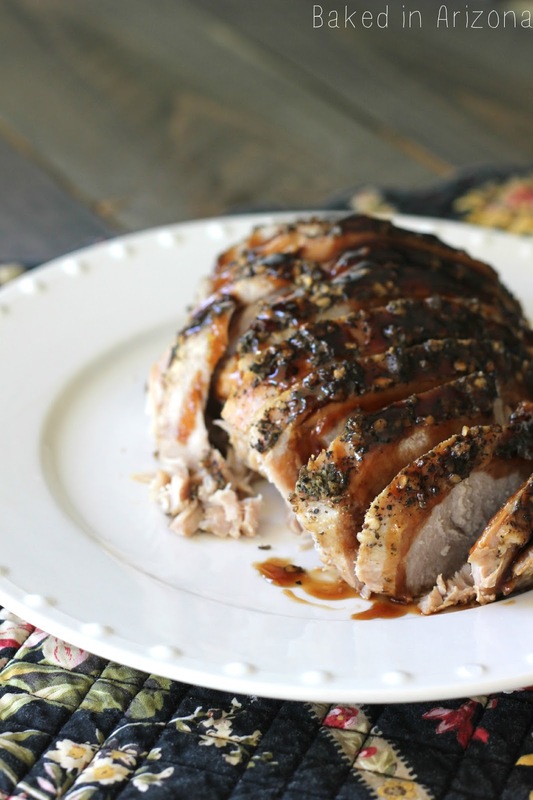 This slow cooker pork recipe is perfect for Sunday dinner! My mother-in-law told me about this recipe a few years ago. She said they loved it, so I was excited to try it out. Until then I had never bought or cooked pork (besides sausage/hot dogs etc.) But a pork roast was new to me. I don’t know why I had never tried it before. The herbs on top of the pork make a nice crust and add a unique flavor. But the glaze, the glaze! It is my favorite part. I drizzle extra not only on my meat but over the vegtables too! This is one of my husbands favorite Sunday meals. (Who is very excited about his pouring skills in the photo above! haha) We love to have a nice, hearty meal on Sundays after we go to Church. 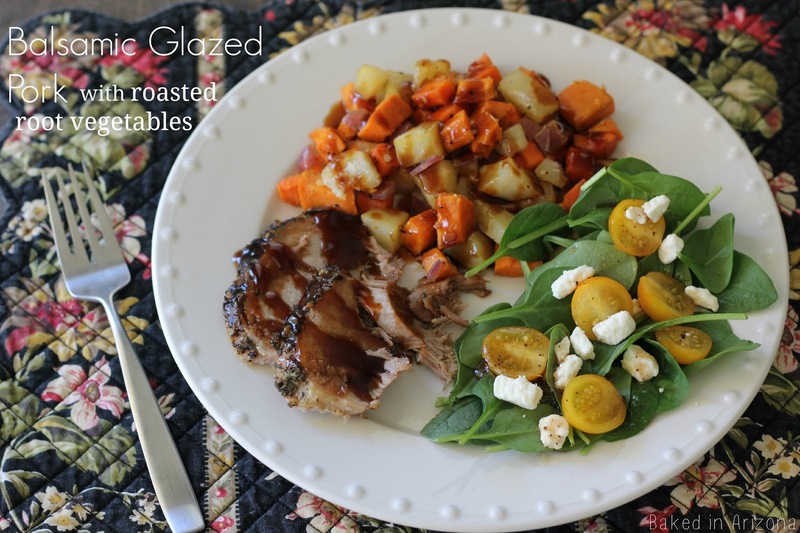 We usually pair the pork with roasted root vegetables and a salad. Even if you don’t go to church, this is a great recipe that you can make in the morning and have waiting for you when you get home! Love a good slow cooker meal. I hope you enjoy this recipe as much as my family does. Place your pork on a plate. In a bowl, combine the rubbed sage, salt, pepper and garlic. Press the seasonings onto the pork. 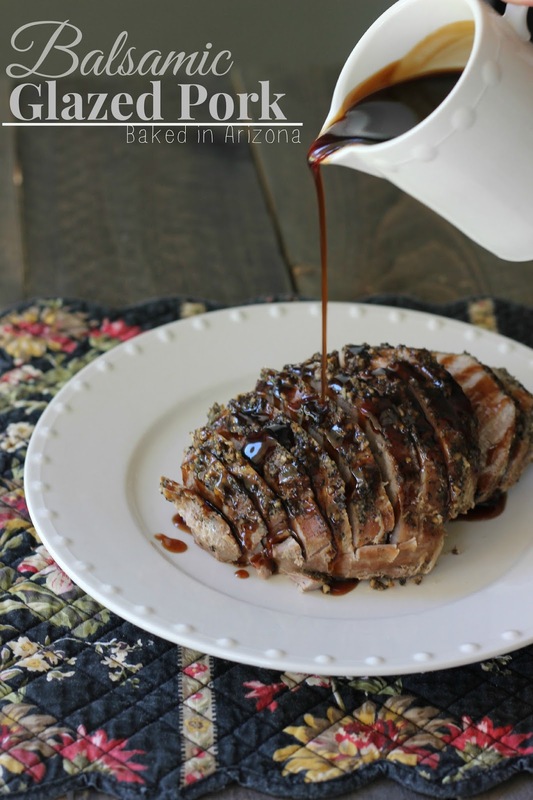 Spray your slow cooker with cooking spray and place the seasoned pork inside. Then pour the ½ cup water along the sides. Cover and cook for 4-6 hours on low. The internal temperature of the roast should be 180 degrees. Drizzle some of the glaze over the roast and let it cook for 30 minutes longer. Remove the roast from the slow cooker and let it sit for 5 minutes. Using an electric knife (or a sharp knife if you don't have one) slice it thinly. Then drizzle more sauce over the top of the pieces of pork. Serve with roasted root vegetables or rice. Pour additional glaze over the vegetables if you want. I always do, it's delicious. Seriously?! This pork sounds to-die-for!!! I'll definitely have to try this for Sunday dinner! Your pictures are beautiful! Pinning!